If you spend time in the incubators, accelerators, or coffee shops of tech hubs, you’re bound to hear entrepreneurs and investors alike talking about finding Product Market Fit (PMF). Finding PMF is the eureka moment that fills the origin stories that great entrepreneurs handed down from founder to founder. It is the imperative and elusive allure of finding PMF that all too often keeps founders up into the late hours of the night. Winning early customers and finding PMF is indeed a critical milestone and profound moment to be celebrated by enterprise startups. Yet, the hard truth is that finding PMF isn’t sufficient to unlock growth for enterprise startups. There’s a missing link between finding PMF and unlocking growth. That missing link didn’t have a name, but it is an equally important milestone and eureka moment. We call the missing link Go-To-Market Fit (GTM Fit). During the period that follows Product-Market Fit, this missing link is the gap between the plan and the frequent reality. 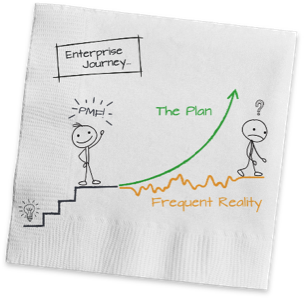 Enterprise startups achieve PMF and rapidly invest in sales and marketing with a plan to unlock growth, only to experience the frequent reality of sales just bumping along. New customers and new revenue grow sporadically, painfully disproportionate to the rapid increase in sales and marketing expense. Cash burn accelerates. Investors and the leadership team get antsy. What gives? 1) A clear Go-To-Market model : Decide how you’re going to sell your product. Examples include direct sales, inside sales, channel sales, online, freemium, etc. 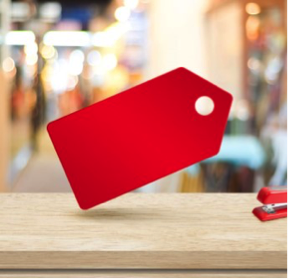 Picking a sales model depends on customer decision making, type of product, price point, gross margin, etc. While startups experiment with several models, it must eventually focus on one model to ramp. A good primer on this is “Leslie’s Compass” by Mark Leslie. 2) A repeatable Go-To-Market Playbook to find and win customers: This is the core of GTM Fit.The GTM Playbook outlines step by step how the company finds, engages, wins, and ramps customers. It’s way more than a simple slide deck and sales tactics. It is a powerful tool that becomes the blueprint for the marketing and selling motion, ramping new sales reps, and aligning the entire company behind what it needs to do to win. Nailing the GTM Playbook is harder than it sounds, requiring distillation, sacrifice, and lots of iteration. If your GTM Playbook doesn’t fit on 1–2 pages, keep distilling. Where did the inspiration for Go-To-Market Fit come from? Looking back at our personal experiences, our colleague’s experiences, and portfolio companies, we looked for the common threads between enterprise startups that unlocked growth and accelerated vs. those that did not. If they didn’t achieve Product-Market Fit, that was easy; they didn’t grow. The surprise was that there were lots of enterprise startups who achieved Product-Market Fit and their first 10 customers but never unlocked growth. Those that did unlock growth were remarkably consistent; they nailed the 3 parts of GTM Fit: 1) clear sales model, 2) a repeatable playbook to find and win customers, and 3) lined up on a wave with urgency. For us, we went through the search for GTM Fit at MobileIron in 2009 and 2010. MobileIron is a now-public mobile security company where Bob was founding CEO and Tae Hea was the original seed investor. Picking the sales model: Some of the most stressful discussions in 2009 and 2010 were around “How do we sell?” Direct? Through channels? Via the Web? We didn’t know. All we knew was that we had to win our first customers through direct selling. But then what? Was that the right long-term model or not? What would scale? What would be practical? Because of our mid-level price point, we decided to go with the “sell 100% through channels,” but, because we were in a new technology market, we would do some “direct touch” to help large customers. We had our sales model. 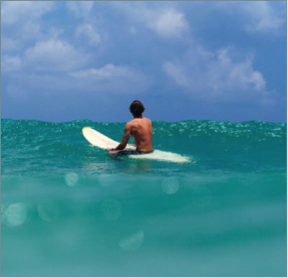 Lining up on urgent wave: Over the course of 2009, we had ground our way to approximately 20 paying customers. The reasons customers bought were clustered around several different use cases and problems: some were mobile security, some were mobile management, some were mobile cost reduction. We engaged on all the fronts to win customers. Then, in early 2010, we began to have customers come to us. We started to feel pull. The problem was securing iPhones. In early 2010, everyone wanted an iPhone at work, but IT departments struggled to secure them. And, users wanted to bring their own devices to work (BYOD). We decided to focus on iPhone security and BYOD. Two meta trends with pain and urgency, as well as the leading edge of a mega wave, that were building. Figuring out the GTM Playbook: The origin of our GTM Playbook was somewhat accidental. While we made plenty of mistakes in the early days, we were pretty good at taking notes about what worked and what didn’t. Soon, a funny thing happened. Everybody else started paying attention to that list. It began to influence our marketing slides, it became a starting point for sales discussions, and it began to be used to teach new sales people. We didn’t know it at the time, but this whiteboard was the seed corn of our GTM playbook. Then, we hired an experienced VP of Sales, John Donnelly, who first taught Bob about the magic of a GTM Playbook. But, at first, Bob didn’t get it. Our GTM Playbook pulled it all together. How we found customers. How we engaged with them. What the objective of each engagement was. What the next step was. What tools we had to make that step successful. Iterating and iterating on the playbook enabled us to find repeatability. Customers started to move from engaged to active. Customers moved from 1st meeting to Eval. Customers moved from Eval to Win. We hired new sales reps and taught them the playbook. We taught our channels the playbook. The company built tools to support each stage of the playbook. 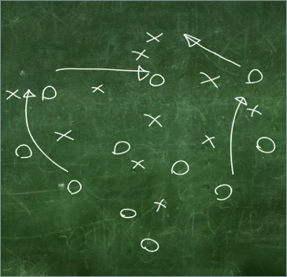 We had found our repeatable GTM Playbook. Finding GTM Fit is hard. The stakes are high. The search is stressful. Iteration and distillation is painful. 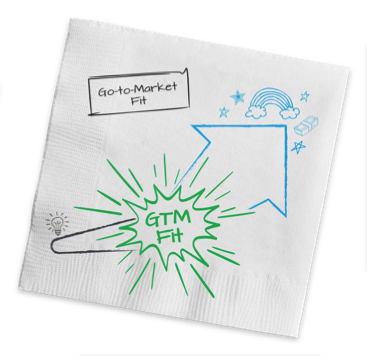 The search for GTM fit creates cultural and organizational changes as the GTM portion of the company evolves. Cash burn goes up. It’s nerve wracking. At the same time, seeing a repeatable recipe to win customers is energizing. Customer wins accelerate. The business accelerates. Everyone in the startup realizes that they aren’t crazy. Hiring grade-A talent becomes easier. Investor interest grows. The startup picks up momentum. You see the path to building a real business. It’s a blast. GTM Fit is the missing link. Find it and unlock growth for your enterprise startup. Good luck! This post is inspired by Survival To Thrival: Building the Enterprise Startup by Bob Tinker & Tae Hea Nahm coming soon to Amazon. 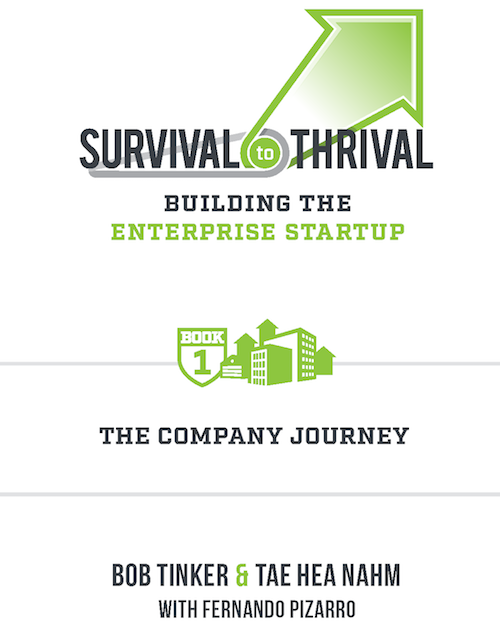 Survival to Thrival is about the missing link for enterprise startup success. 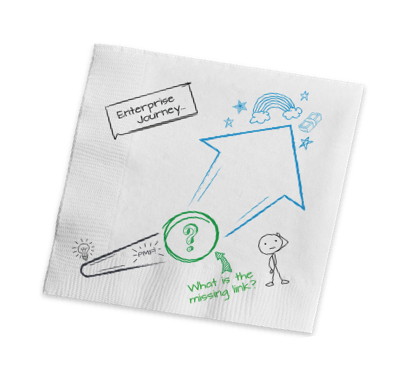 This strategic yet practical narrative illustrates how enterprise startups are different than consumer, highlights the path from Product-Market Fit to sustainable growth and revenue, and provides a tactical playbook with real world examples. If you enjoyed this article, please give it some claps and share it around on the socials! Feel free to leave a comment below!